Land Deal: Build a House in Godfrey, IL and Get your Lot for Free! In the town of Grafton, IL, there is a potential land deal waiting for you. There are a number of vacant lots available in the Grafton Hills Neighborhood requiring continuous maintenance and upkeep such as mowing the grass. City leaders have come up with a way to attract potential home owners to build on these vacant lots. Here’s the deal: Each lot is available for $15,000. If you purchase a lot, the city of Grafton will give you one year to build a home worth $150,000. If you complete the home within a year, the Grafton will give you your $15,000 back that you paid for the lot. Ranch house plans are very popular among home builders and homeowners because they are versatile and accommodating. Below is a list of important information about these well disposed, one-story floor plans. Take some time to view the list before searching for ranch home plans online at popular websites like The House Plan Shop. Ranch house plans are usually built on one level and sometimes referred to as one-story house plans. These homes have no particular noteworthy exterior characteristic except they are noticeably built with one floor. The exteriors of ranch home plans can range from a simple façade and steep gable roof to an intricately detailed façade with a low-pitch, hip roofline. They typically have an asymmetrical footprint. Open floor plans with few walls are common. These designs span a broad range of sizes from simple Cottage floor plans to grand, Luxury homes. Ranch floor plans can accommodate all phases of life beginning with singles and new families and extending to large and growing families, empty nesters and retirees. One-story homes are very popular among young buyers and retirees because they are accessible to people of all abilities and safe for children because they do not have stairs. These homes are available in an array of styles including Craftsman house plans, Traditional home designs, Country floor plans and modern Vacation homes. Some of the most common features included in ranch house plans are an attached garage, rear access to a deck, porch or patio, large picture windows and combined living and dining areas. These designs appeal to budget-conscious buyers as they make practical and efficient use of space. One-story designs deliver everything from the basic amenities to lavish features and state-of-the-art amenities. 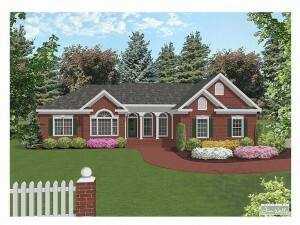 Ranch home plans are available in a variety of layouts. Bedroom-together designs cluster all the bedrooms on one side of the home, ideal for families with small children, while split bedroom floor plans separate the master bedroom from the secondary bedrooms offering privacy to the master suite. Some one-story homes are built on a walkout basement making them suitable for a hillside, rugged mountain terrain or a sloping lot while adding finished living space on the terrace level. The atrium ranch plan is a variation that features a wall of windows as the backdrop to the stairs leading to the finished lower level. Split-level homes are another variation of one-story houses that make efficient use of space on a front-sloping lot or a narrow lot by stacking levels. One-story designs are sometimes called rancher plans and rambling ranches. Single-story houses are widely found throughout the United States and Canada. Will My Stock House Plans Include an Electrical Plan? Customers purchasing stock house plans often ask if their blueprints will include an electrical plan. In most cases, but not all, the floor plans will include a simple electrical plan. The electrical layout may be shown on a separate page in the construction drawings, or it might be shown on the floor plan page(s) of the blueprints. Stock house plans that do include a simple electrical plan will reflect suggested locations for outlets, switches and fixtures. However, they will not include a detailed wiring schematic showing exactly where to run the wiring, etc. 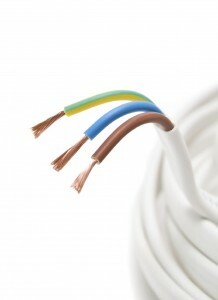 The truth of the matter is all the electrical work in the new home must meet local building and electrical codes. It is up to the electrician working on the home to wire the house according to local electrical codes. It is also the electrician’s job to install the outlets, switches, fixtures and the electrical box in the proper places as designated by the electrical codes in place for the area, city, county or municipality where the house is being built. For more information about what is included in a set of stock house plans, please review The House Plan Shop’s FAQs. Are you considering building a house? Are you shopping for house plans? If your family enjoys the water, sunbathing and exciting pool parties with friends and family, consider a house plan designed to make the most of a backyard swimming pool. 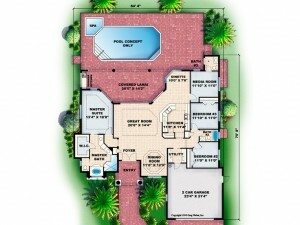 Home plan websites such as The House Plan Shop, offer a variety of floor plans designed for maximum enjoyment of a pool. Below are a few points to consider about home floor plans fashioned with a pool in mind. House plans designed for a pool, includes built-in the best pool skimmer, are often oriented with poolside views from the main level and the upper level. Larger windows or extra windows are positioned for the view. There is nothing like gazing out of the bedroom or breakfast room window first thing in the morning and seeing that sparkling blue water. Others enjoy the pool’s tranquil look at the end of a long day. The pool’s soothing calmness promotes relaxation no matter when you catch a glance of it from inside the house. Floor plans for poolside living commonly include features and elements designed to promote outdoor living and entertaining. Some home plans showcase extensive covered patios, open patios, lanais and terraces all leading up to the water’s edge. There is plenty of room for everyone to gather outdoors and enjoy a pool party and summertime barbecue. If you prefer to draw the outdoors in, consider pool house plans that incorporate glass sliders or folding glass doors that open the living areas of the home to the patio and pool. Summer kitchens are another feature frequently found with house plans designed for a pool. They are great for grilling and dining alfresco beside the water while delivering you and your guests a refreshing atmosphere in which to dine. Look for floor plans that offer pool houses or a cabana. They provide a place for guests to change clothes without tracking wet footprints throughout your home. Likewise house plans that include an interior bathroom with outdoor access to the pool or a separate bath positioned near the pool allow convenient restroom access while keeping your guests close to the pool instead of in your home. Pools require lots of “stuff” like chemicals, water toys, various floats, tools and a cover to keep the pool clean. Some house plans include a small utilitarian structure, like a shed, for pool storage keeping everything in a safe place and out of a child’s reach when not in use. If you’re looking for a healthier lifestyle, house plans designed for pools will encourage both exercise and relaxation for the whole family. If you have house plan designed for a pool with a swimming pool remodeling contractor, your family will be more likely to use the pool, have fun and get a fair amount of exercise because the pool is so convenient. If you have to drive to a neighborhood pool, you might be less likely to use it on a regular basis. With a house plan designed for a backyard pool, you’ll be able to swim whenever you desire even if it is just for a few minutes each day. And what better way to relax after a long day at work than to jump in the pool for a refreshing swim, float on a raft in the sun or enjoy a little family time with the kids? If these ideas sound appealing to you, take some time to browse The House Plan Shop’s extensive collection of top selling house plans to find a floor plan designed for a backyard pool. Sometimes when homeowners decide to build a new house, they question the importance of buying house plans. Some may think it is an unnecessary expense in the building process and may try to work from the basic floor plans shown in home plan books and on house plan websites instead. However, the truth of the matter is pre-drawn house plans are a vital part of the home construction process. It is important and necessary to purchase blueprints before construction begins. Below is a list of reasons why a new homeowner should purchase pre-drawn house plans when building a new home. · Buying blueprints gives the homeowner permission from the designer to build the designer’s original, copyrighted plan without breaking any copyright laws. It grants the homeowner legal permission to build the home. · A set of home plans is the most complete resource you and the builder will have for the entire house building project. · House plans outline the design you are building before construction begins providing an overall concept of the entire building project. · The blueprints will clearly illustrate what the homeowner expects the finished house to look like when construction is complete. · Blueprints are a useful tool in preparing your site or lot, planning the interior space, creating a building schedule with the builder and setting a budget. · House plans outline the home’s complete structure from the foundation and wall framing to the roof framing and interior layout. · Home plan blueprints map boundaries for every room, indicate the square footage of the home and depict major elements on the floor plan such as bathtubs, sinks, the kitchen island and stairs to the upper or lower level. · Blueprints depict changes in elevations. For instance, within the home they will show a staircase to the second floor. The exterior elevations depict how the home will sit on the lot in relation to the grade of the land such as a home with a walkout basement or drive-under garage. · Floor plans provide a “map” and call attention to consideration for any special elements such as a garage, patio, deck, or interior features like a fireplace or built-in media center. · Special features that require additional work such as a stone fireplace or an intricate handrail will be contained in the blueprint. · Because stock house plan designers create house floor plans with many of today’s most requested features in mind, they are a smart and less expensive alternative to drawing a home plan from scratch. These plans provide most of the features you are looking for at a fraction of the cost. · Various pre-drawn blueprint packages (CAD files and reproducible masters) come with a copyright release allowing the homeowner to work with a professional designer to make changes/customize to the original copyrighted plan, further accommodating specific needs. If you are considering building a new home, take some time to review the importance of purchasing house plans. For further information about buying house plans and blueprints, take some time to review all the helpful information in The House Plan Shop’s resource section.